Enter the total number of pages or originals in the document. Please note that this is NOT the number of sheets of paper. This is the number of sides, regardless of whether they are printed 1-sided or 2-sided. In a PDF or Word file, it is the page count shown in the top or bottom menu bars. * Finished Size: --- Please Select --- 5.5 in. x 8.5 in. (-50%) 8.5 in. x 11 in. 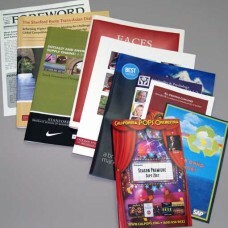 Copy Factory specializes in printing and binding booklets and multiple page newsletters. We do top quality work at affordable prices and are committed to conscientious customer service. Booklets are bound using the saddle-stitch binding method commonly used for magazines where the printed sheets are folded in half and stapled on the center fold. Choose to use a heavier paper stock for the cover or use the same paper throughout for a "self-cover" booklet or newsletter. For documents larger than 80 pages, choose one of the Bound Books categories. Please check out our file preparation guidelines for tips in setting up your files by following the link on the right hand panel. Please contact us for quotes on custom projects.